I bought the below bonsai tree from Home Depot as a Xmas gift for a friend. I haven't even given the gift yet and the leaves are already starting to fall out en masse. I have the tree indoors in indirect sunlight. When it started losing the leaves I moved it to direct sunlight by a window ledge which didn't seem to help. There was no identifying tag on the plant. This is my third bonsai and I don't want this one to die as well! Any advice on why this is happening and how to salvage it before it's too late? I moved it to a more direct sunlit location and leaves seemed to stop falling out so much. I'm not sure what type of plant that is, but from the look of it, you need to check a couple of things out. One is to check and see if those rocks are glued on. Home Depot and other similar stores take a random plant, strip a few leaves off and call it a bonsai. A bonsai is supposed to represent and old, old version of the tree you are growing. This includes a tapering of the trunk, drooping branches from years of snow loads, etc... most of these plants don't have that. Regardless of that fact, what I've seen is that they prep these plants somewhere and to keep them looking pretty, they glue the rock in place to keep them from moving in shipping. The glue prevents the rocks from moving, but also prevents water from penetrating, which could be why it's loosing leaves. You'll probably also find that they put regular potting soil under the rocks, which is not appropriate for bonsai. You can look online and find many recipes for bonsai soil and how to wire and shape them. Chances are, you could probably turn this into a real bonsai. What you'll find with the soils is that they are mostly inorganic rock-like material. The more organics you have, the more water it retains, but it's not good for the plant. However, the less you have, the more you have to water. So it's about finding a balance for the weather you have in your area. Basically, you want to put a chop stick in the "soil" and leave it in there for about 15min. If you pull it out and it's dry, you need to water. Water from the top down, soaking the leaves and water till it runs out the bottom of the pot. About once a month, during the growing season, water it with 1/4-1/2 strength balances miracle grow fertilizer, or you can buy a bonsai fertilizer. And like some of the other posters stated, most bonsai need to be outside as much as possible or they won't survive. My juniper bonsai needs to be out in the full sun and needs the cold of winter to do well. root ball going dry: small root balls dry out faster. Leaves shed due to dryness are usually dry. Older leaves are shed first. root ball too wet for an extended period. Leaves fall and still have moisture in them. some species are more fragile than others and will drop leaves with the slightest change. 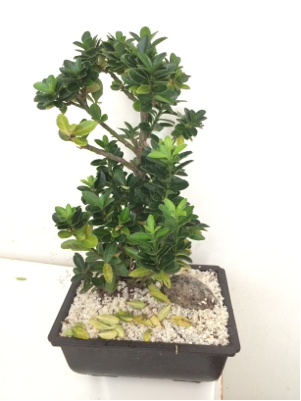 Poorly treated ficus are an example. For this gift keep up with good light and regular watering. The exposed trunk just adds character! This is a sure sign of stress. Take the plant out of its container and put in a larger one with ultra rich potting soil. Put in direct sunlight in days and keep warm at nights (away from windows). Water every 3 days and it should pull right out of the shock. This is boxwood plant also. Most bonsai are not meant to be kept indoors period, unless it is tropical and then probably only in winter. That looks like a boxwood to me, hard to tell. Boxwood are hardy, but can also be finicky, at least for me. Most likely it's not getting enough light and it maybe reacting to a change in temperature. Dropping leaves doesn't necessarily spell doom. Yellowing could mean too much water too. Bonsai should be watered until water flows out the bottom, this helps eliminate salt build up in the soil, and it should be fast draining. Since this is a store bought bonsai it probably has normal soil, so you have to be careful about over watering it and keeping the roots too wet. Most likely due to lack of water. Do not soak in sink. Instead, water from above with a small water can rose,like you are simulating rain :). Water until you see the water start to flow through the drainage holes on the bottom. Leave for about 30mins, then repeat the watering. The reason for this is that most of the water may have run down the sides of the pot on the first watering if the soil was dried and compacted. Also, put gravel in a shallow tray that is wider than the tree itself. Put some water in this tray and place the potted bonsai on top. This water will evaporate and create a nice humid condition around the tree. Check the soil every day by pushing a skewer into the soil. If the skewer comes out moist, then don't water yet. Bonsai should never be in lots of water as the roots will rot. Allow the soil to dry out slightly between waterings. This looks like a variety of Euonymus as Bamboo suggested, not boxwood. Whatever you do do NOT repot this bonsai in a bigger pot...as was mentioned above. It is simply stressed from adjusting to new environments. Bonsai need to be watered almost every day. So little soil and they dry out quickly. I put the entire pot in a basin of water to soak. Also washes dust off leaves. Keep out of drafts. Bright light but not direct light. Can do fine out doors but keep under cover, Euonymus are great with shade. Keep indoors during any freezing weather but don't haul from indoors to outdoors or viseversa. I take my indoor plants outside on a covered patio when the weather is warm and predictable in the spring. But coming back inside for the winter I bring them inside during the night and keep lengthening the time spent indoors to reduce stress. You might want to do this to accustom your bonsai to the outdoors in the spring, depending on your weather. Take it out for a few hours on the covered porch and extend the amount of time until it can stay out all summer. Water everyday. This is ONLY true for Bonsai! And use bottled or distilled water for your Bonsai, NOT tap water! Too many salts, fluoride is toxic! For us humans as well! Consult your book on fertilization...very important. Slow release organic fertilizer but very little and more often than other house plants or garden plants. Good luck...great gift but unless your friend is a gardener, I'd keep it and learn to keep it alive. Kind of like buying someone a pet...be careful! Not the answer you're looking for? Browse other questions tagged identification watering leaves bonsai or ask your own question. How do I revive an air-layer that has dropped all its leaves? How should I care for a bonsai Bouganvillea? What type of bonsai is this, and how do I revive it? How to revive a bonsai that was repotted after it was dying of overwatering?